Just gonna throw in some Halloween ideas if you are in a rut, budget, or last minute quick faces. 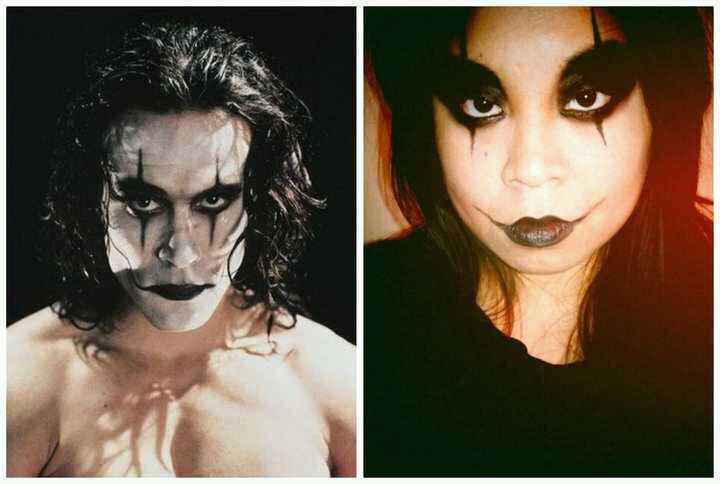 Bruce and Brandon Lee are my favorites of all time. And well, The Crow - it's a classic. Very easy and it's a 10 minute look - depending on your expertise. For my look, I didn't want to be too ghoulish so I stuck with my regular foundation. However - you can be a free spirit and choose what you prefer. Apply, blend, and set. As for the eyes, I outlined the shape using a black eye pencil, filled it in, and set it with black matte eyeshadow. THIS WILL SET THE PENCIL AND PREVENT ANY SMEARING. If you prefer gel eyeliner over the pencil you can do so BUT you must set it with black eyeshadow. Black lipstick and to make that Chelsea grin I used black lipstick to do the linework. And you're done! Easy like Sunday morning.